The proximity marketing market is expected to be worth USD 52.46 Billion by 2022, at a CAGR of 29.8% between 2016 and 2022. The base year considered for the study is 2015 and the forecast period is between 2016 and 2022. To define, describe, and forecast the proximity marketing market, in terms of value and volume, segmented on the basis of hardware. This report provides valuable insights into the ecosystem of the proximity marketing market. The major players in this industry include Apple Inc. (U.S.), Google Inc. (U.S.), Microsoft Corporation (U.S.), Qualcomm Inc. (U.S.), Zebra Technologies Corporation (U.S), Bluvision Inc. (U.S.), Estimote Inc. (U.S.), inMarket Media LLC (Italy), Proxama PLC (U.K.), ROXIMITY (U.S.), Shopkick Inc. (U.S.), Swirl Networks (U.S.), and Unacast (U.S.), among others. In the modern world of advanced technologies, proximity marketing is a promising and upcoming medium in the field of information and advertising across sectors. 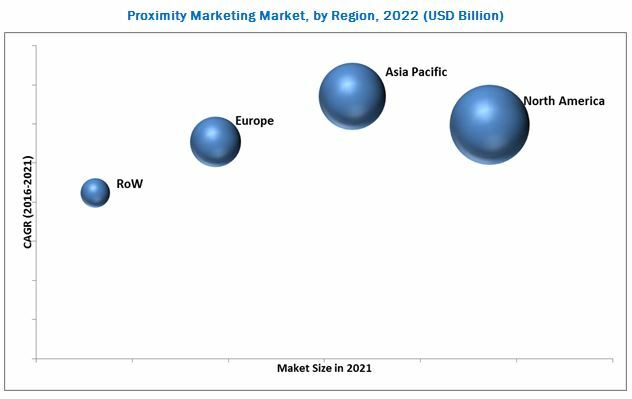 The proximity marketing market was valued at USD 9.01 Billion in 2015 and is expected to reach USD 52.46 Billion by 2022, at a CAGR of 29.8% during the forecast period. Proximity marketing is gaining traction among retailers to send special offers to their customers when they come within proximity of a certain retail outlet’s location. Proximity marketing is the perfect way to target the desired audiences and is expected to be widely accepted by marketers in the years to come. 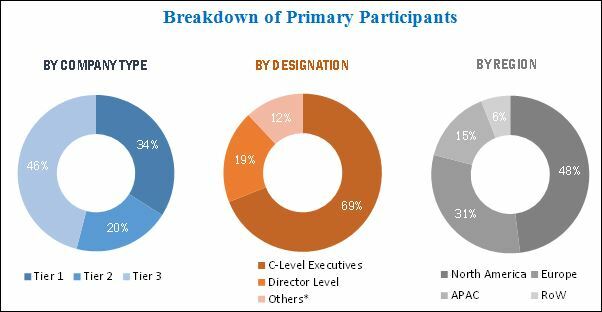 The growth of the market is propelled by the increased focus on business intelligence and rising market competitiveness along with the growing adoption of smartphones and proximity technology. The market is further driven by factors such as increasing technological advancements in location-based services, increased use of beacons, and growing need for better customer services & response. The scope of this report covers the proximity marketing market on the basis of location, technology, hardware, software, service, application, and geography. The indoor proximity marketing market held the largest share of the proxmarket on the basis of location. On the basis of offering, the hardware segment led the global market in 2015. The market for BLE beacons-based proximity marketing is expected to grow at the highest CAGR during the forecast period owing to its applications in multi-channel marketing and in product distribution in the retail industry. The retail and e-commerce application led the proximity marketing market in terms of in 2015 and the trend is expected to continue till 2022. The market for deployment and integration services is expected to register the highest growth rate during the forecast period. North America held the largest share of the market in 2015, while the APAC region is expected to grow at the highest CAGR during the forecast period. In 2015, the intensity of competitive rivalry, threat of new entrants, and bargaining power of buyers had a high impact on the proximity marketing market. North America held the largest share of the proximity marketing market in 2015, whereas APAC is expected to register the highest growth rate in this market between 2015 and 2022. The increase in smartphone penetration, availability of mobile Internet, growing use of mobile applications & mobile web, and introduction of 4G network by the carriers are some of the factors responsible for the dominance of North America in the market. The major factors restraining the growth of market are the concerns regarding security & privacy, low awareness among end users, and lack of expert workforce. Moreover, understanding the consumer behavior poses a key challenge for proximity marketing market players. The major players in this market include Apple Inc. (U.S.), Google Inc. (U.S.), Microsoft Corporation (U.S.), Qualcomm Inc. (U.S.), Zebra Technologies Corporation (U.S.), Bluvision Inc. (U.S.), Estimote Inc. (U.S.), inMarket Media LLC (Italy), Proxama PLC (U.K.), ROXIMITY (U.S.), Shopkick Inc. (U.S.), Swirl Networks (U.S.), and Unacast (U.S.), among others.